Meet Florence Connoisseur Nardia Plumridge: the woman behind the blog Lost in Florence - and the book! We prouly host this exclusive book presentation and are honoured that Enoteca Sei Divino is featured in it as well !! 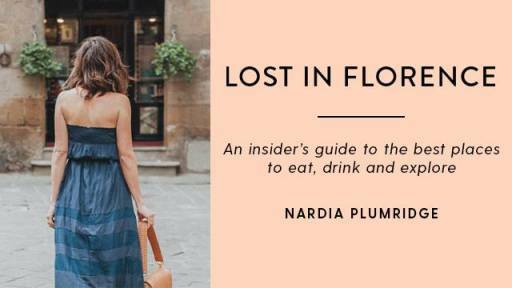 To celebrate this beautiful happening we have invited Nardia to come and present her brand new book, share some juicy tips about Florence and tell us her secrets about how to set up a blog - and turn it into such a massive success! This special night is exclusively for true Florence Connoisseurs who are passionate about this gorgeus city and are looking to get to know other aficionados and share insider information. the event will start at 7pm with the time to sip some wine, eat some bites and do some casual networking. This will be followed by a short interview with the author herself, the space to ask questions on Florence and how to become such a successful blogger and your chance to buy your copy of the book (pre-sale!) and get it signed on the spot! The event includes 2 glasses of wine and two of Sei Divino's aperitivo dishes. Come and join if you want to meet new friends in Florence, share your knowledge about this city and get insider info from the Florence Connoisseur par excellence Nardia Plumridge. Save your spot now by selecting "going" for this event. Looking forward to seeing you there!